Certified potato seed saves African farmers from ruin. Photo: Neil Palmer (CIAT). After a highly aggressive mystery maize disease crippled crops in 2011, Kenya’s number two crop – potato – could be a smart investment. Already there are 800,000 potato farmers in Kenya. Payoffs from potato can be high in terms of both income and nutrition. But only if farmers can get their hands on clean planting material. Amon Mgendi, a potato farmer in the Taita district of Kenya, has been practicing potato farming for several decades. But his opportunity to make it a lucrative business only presented itself after a training course in 2009 with the International Potato Center. The course focused on methods to produce high-quality potato seed through conventional methods, but more quickly and at lower cost than traditional methods. Known as three-generation, or 3G, the strategy creates large numbers of minitubers (or seed) for planting through very rapid multiplication – in three field generations instead of the usual seven required to produce enough tubers for a cost-effective sale. Amon has been planting about one acre of seed every season, garnering a net profit of about $600 (KSh. 50,000). More than 100 potato farmers have since benefited from his supply of clean seed. Unlike his neighbors, whose potato crops reeled under devastating effects of bacterial wilt and late blight in 2011, his farm stands out as center of excellence. With the earning from his potatoes, Mr. Mgendi has started a retail shop, which he proudly refers to as the shop that potatoes built. He also has been able to finance a posho mill (for grinding wheat or maize into flour) from his potato profits. Mr. Mgendi is not alone. In his district, there are approximately 60 trained farmers also working either individually or in groups to create a seed business– up from only 20 when the project began. 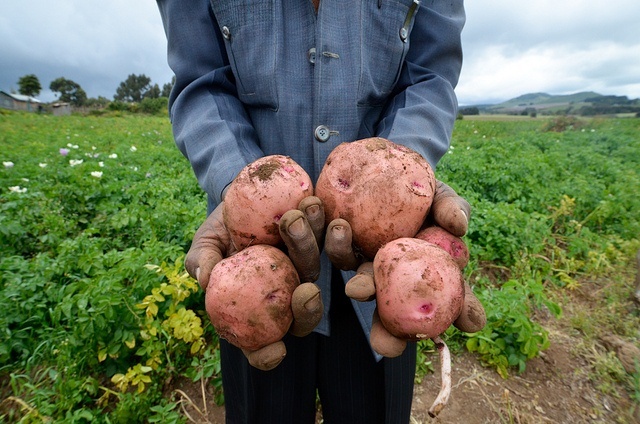 Further north, near Meru at the foot of Mount Kenya, lifelong potato grower, Nathan Muthamia, is also reaping profits from his seed potato production. In this region, where a mystery disease is wreaking havoc on maize crops, potato farmers are watching their yields drop each year due to infestation of their seed from pests or disease. But Mr. Muthamia has taken part in an initiative of the International Potato Center using a system of aeroponics to produce clean, certified potato seed, which could enable farmers to significantly boost their yields. Aeroponics is a soil-less technology that grows potatoes in a medium of sterile sand or nutrients to eliminate contact with pests or diseases. It produces more mini tubers, more rapidly than standard soil-based methods. The aim for producers like Mr. Muthamia is to pass the seeds to other smallholders for use in multiplying their own seed to sell and produce their own potato crops. When asked if he would consider returning to his former system of potato production – where he sourced uncertified seeds from his neighbours – he claps his hands, and shakes his head with a big, incredulous smile. “My house was built with the money from the new potatoes!” he exclaims, noting that during a break-in last Christmas at his farm, the only thing to be stolen was his precious stock of 20,000 clean, certified potato seeds – a valuable stock indeed.